Raúl Sánchez is a Seattle Bio-Tech technician, eschatologist, colletic, prosody enthusiast, hamartiologist, translator, DJ, and cook who conducts workshops on The Day of the Dead. He was featured in the program for the 2011 Burning Word Poetry Festival in Leavenworth WA. His most recent work is the translation of John Burgess’ Punk Poems in his book Graffito. 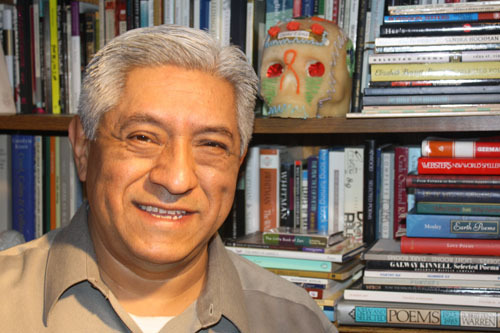 He has been a board member of the Washington Poets Association and is a moderator for the Poets Responding to SB 1070 Facebook page. His work appeared on-line in The Sylvan Echo, Flurry, Gazoobitales, Pirene’s Fountain and many, many times in La Bloga’s Floricanto weekly Tuesday edition. His book has been nominated for the Washington State Book Award in Poetry for 2013. Raúl comes from a place south where the sun shines fiercely. He lives in a place surrounded by asphalt, cement, full of rushing cars, coffee houses, fancy houses, empty houses. Where seasons shine and hide in the winter months. Where birds stop on their way south to the land of the sun. Where blessed rain, oh! blessed rain falls. Raúl will be at the MoonPath Press group reading at Open Books, Seattle, WA. Saturday, November 3rd from 7:00pm - 8:30pm. Raúl reading "Brown Angels at Work" on Youtube. Raúl reading "Euphoria," "Breath," and "Dandelion" in both Spanish and English.